ABBYY FlexiCapture 12 Distributed is installed on multiple computers and is intended for processing large volumes of documents in enterprise environments. This edition is highly scalable, offers centralized control console, and supports complex routing schemes, where documents are distributed among Operators in charge of different types of batches or documents. ABBYY FlexiCapture is a powerful data capture and document processing solution from a world-leading technology vendor. It is designed to transform streams of documents of any structure and complexity into business-ready data. And its award-winning recognition technologies, automatic document classification, plus a highly scalable and customizable architecture, mean that it can help companies and organizations of any size to streamline their business processes, increase efficiency and reduce costs. Forms processing is a process whereby information entered into data fields is converted into electronic form. Automated form processing software interprets machine-print (OCR), isolated handprint (ICR), mark sense (OMR) and barcodes from paper forms. ABBYY FlexiCapture is highly accurate and scalable document imaging and data extraction software that automatically transforms documents of any structure, language or content into usable and accessible business-ready data. Intelligent self-learning classification and state-of-the-art recognition technologies enable FlexiCapture to replace error-prone manual processes with automatic document classification and processing. FlexiCapture Scanning Station enables easy scanning with any TWAIN-, ISIS- and WIA-enabled device. Available in thick and thin client versions. ABBYY Image Enhancement automatically improves images captured by mobile devices to optimize processing. It is also indispensable for processing documents with complex backgrounds like transcripts, identification documents and transportation forms, while automatically optimizing the image for processing or providing immediate feedback if image quality is poor. Features such as auto crop, background whitening, image quality assessment and capability to create custom enhancement profiles for different image sources, help process all documents regardless of their quality or source. At the recognition stage, document images are assembled into multi-page documents or document sets. Their content and data are intelligently extracted and validated automatically in an unattended mode. This task can be done either by separators (e.g. blank pages inserted between the two documents), page counters, or with the help of ABBYY neural-based classification algorithms that automatically identify. Group verification allows verifying the similar checkmarks or digits across batch of documents by displaying all discovered versions in a single Verification window. Recognized data fields can be viewed simultaneously and compared against the original document image. Poorly recognized characters (e.g. 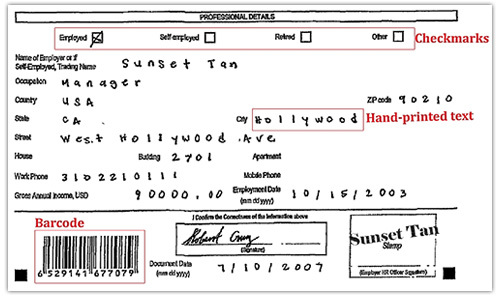 handwritten text or notes) can be typed manually into the fields. A web verification station deployed on a third-party system can be accessed via single sign-on technology (using SAML 2.0). Users interact with the integrated web verification station the same way they interact with a non-integrated station. Field verification mode enables automatic checking of data fields one by one, or the characters in a field. ABBYY FlexiCapture automatically exports recognized data to different file formats, or to databases, systems of record and other destination points in line with user-defined rules. Document set images can be exported to one PDF file or placed in a storage location. A file or database record should describe the structure of the document set and contain a link to each document image. Document set fields (including fields in child documents) can be exported to ODBS databases and files. All fields in child documents are available when setting up an export; you can set up mapping and redact sensitive information both in a document section and in linked documents. FlexiCapture HTML5 administration and monitoring station enables 24/7 supervision from any physical location. It provides multi-level administration, automatic notifications for critical failures, and comprehensive reporting. Administration and monitoring allows for monitoring of processing times and pick loads. The system administrator is able to monitor system health, the overall system and each tenant productivity, and to receive notifications about imminent database overflow. Three standard types of reporting are available: site productivity, processing productivity, and general operator report. The reports can be generated as PDF file or CSF for further analysis. Microsoft Report Viewer is used as the default tool for generating reports. Although Crystal Reports are not shipped with the product, users who have this product installed on their computers can continue using it for generating reports. International companies can now enjoy a single solution for processing documents in multiple languages - including Chinese, Japanese, Korean, Vietnamese and 183 more! Elimination of labor-intensive operations guarantees fast ROI, while web-based clients and easy-to-configure data extraction ensure low TCO. Reduce costs and utilize your workforce more efficiently with Web-based data verification. Operators simply log in to perform manual verification tasks. Capture documents at point of entry to reduce processing time, delivery costs and the space needed for storing paper documents. With the help of Web Capture Station, scanning and verification can be performed in a single web-based interface. This enables front office document capture without the need for a thick client application – and speeds business processes by capturing documents at point of origin then quickly delivering them to the back-end. Advanced server-based architecture enables effective processing of large volumes of documents. A powerful processing server handles all resource-intensive operations – performing automated task distribution among the processing stations and load balancing. Microsoft Cluster support ensures consistent system operation and prevents data loss in case of system failure. A flexible workflow can easily be adjusted to your specific business processes. FlexiCapture offers a powerful set of tools for modifying the basic document processing workflow with custom processing stages, scripts, and external modules. The workflow also enables document processing in a fully unattended mode. With controllable training technology, simple “point-and-click” input can be used to create layout descriptions and to define document types for classification. Layout descriptions can automatically be generated simply by indicating elements and data fields for extraction on several images. Additionally, document descriptions can be fine-tuned in order to achieve even higher accuracy in locating document fields. As opposed to "black-box" self-learning systems, ABBYY FlexiCapture gives full control over the training results. Business-critical data fields can be verified by two operators independently to rule out program or human error. Data will be accepted by the system as verified only after proofreading results coincide from both operators. 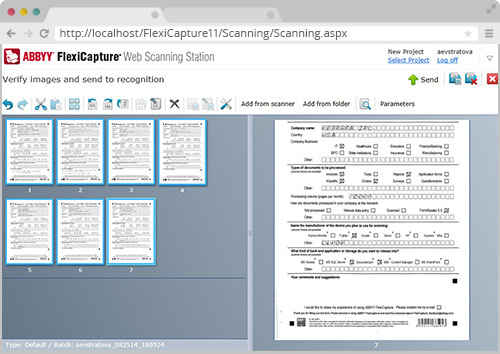 As a part of the Standard Verification Station, FlexiCapture offers scripting tools for customization of the user interface. This feature is ideal for projects where additional tools are required for specific operators, or where special regulations must be adhered to and monitored. Whether the requirement is to modify menus and toolbars, add controls for document-specific functions, or change the station’s behavior to fit a particular scenario, all the changes can be scripted within FlexiCapture. Custom reports for system and operator performance monitoring are available in FlexiCapture. Crystal Reports Editor can be used by administrators to generate custom reports from FlexiCapture’s database. Designing blank fixed forms has never been easier. 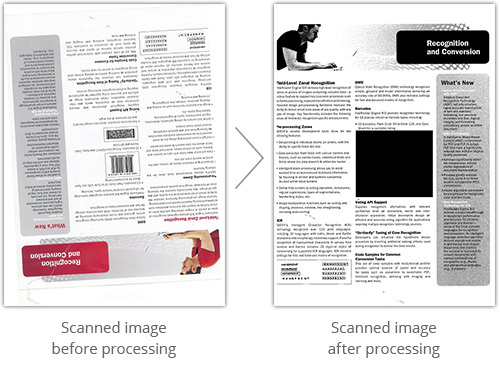 Data-merging profiles can merge barcodes and images to create new ways to automate high-volume jobs. Easy-to-use default settings, drag-and-drop multipage support, and more, also enable faster form design.